Strategic communications planning is defined as communicating a concept, a process, or data that satisfies a long term strategic goal of an organization through a process of advanced planning, according to Wikipedia. The communications part of this process involves organizations creating content and delivering information to the general public, prospects, customers, shareholders, employees, journalists, producers, educators, researchers, and consumers. As communication channels have expanded through the evolution of digital and social media, the science of communications planning has also evolved. The danger of fragmentation, and haphazard communication, is greater than ever. Content is now king. Mapping that content to your intended audience, understanding how different audiences access and consume information, and using that information to determine which channels should be used to deliver that content is where the strategy comes in to play. Communications without the strategic part of the process is careless, unplanned, and ineffective–not to mention a waste of money. Communications without a plan wastes resources, embarrasses organizations, and fails to achieve any concrete goals. It all starts with a powerful story. Does your company research and develop products that impact overall survival and time to progression in cancer patients? Or does it give hope in a future where Dad will be there to walk his daughter down the aisle on her wedding day? Does your organization provide technology for the detection of food bourne pathogens? Or do you make it possible for families to eat healthy meals without the fear of children getting sick from salmonella poisoning? The answer to all of the above questions is “yes.” But let’s face it, in each scenario, only one message is really going to reach people on an emotional level. In the age of channel convergence, where the lines between brand publishing, marketing and journalism are blurred, powerful stories make the difference between connecting with your audience or just contributing more white noise. Emotional connections matter more than ever before. Tell a powerful story, do it with relevant content, and pick your delivery channels based on your buyer personas. Of course, messages will be different depending on whether your intended audience is business, professional or consumer. So it is important create messages for each audience that support the overall story you want to tell. I am consistently amazed at the amount of times over the years that I’ve been approached by clients who were confused about who their ideal customers were. Or what their sales funnel looked like. Without a clear understanding of your buyer personas–what your ideal customer looks like; how they get information and make purchasing decisions–how can you develop content and messaging that will have any impact? And unless you have a clear understanding of your sales process–the way that prospects find you, learn about you, evaluate and buy your organization’s product or services–you aren’t ready to start building your content plan. Our client relationships often start by going back to the beginning and helping our clients answer these questions. Then we can really create value by mapping content to each stage of the sales process so that mildly interested visitors to your web site evolve into wildly enthusiastic advocates for your brand and your company. 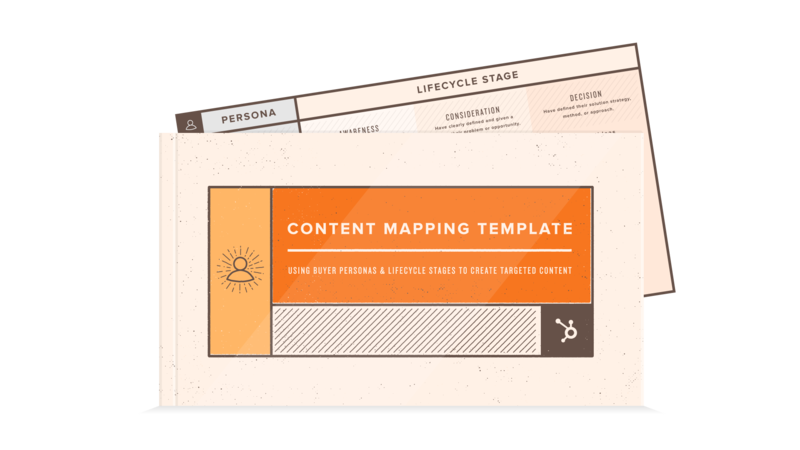 Once you’ve done your research, created your story and audience-specific messages, and defined your buyer personas, you are ready to build a content map. A content map organizes your messages, links each message to a specific target audience or buyer persona, defines what content will be delivered to each audience, and identifies which media channels will be used to deliver that content. The great news here is that there is no need to reinvent the wheel when it comes to creating a template for your content map. There are a number of excellent, ready made templates that you can use, available online through organizations like the Content Marketing Institute, HubSpot, Social Media Today, and a number of other sources, and most of them are free to download. Content mapping and content creation are two areas where working with a great content marketing agency partner can be a huge advantage. Especially if the agency you are working with has strong expertise in your industry, and employs writers who know your subject area well. We call that “editorial horsepower,” and it really comes in handy when you have busy people who don’t have the time to write blogs, create website pages, develop white papers, create newsletters, shoot videos and publish magazine articles. Content development is critical, and it takes focus and persistence to build and manage a pipeline of relevant content. Understanding exactly what kind of content makes the most sense is another important consideration. Is your goal to build thought leadership in your industry? Educate customers? Generate leads? Establish the unmet need that your products or services help to fill? Knowing your objectives will help you select the right mix of content for your company. The list goes on, and it is limited only by your imagination and your resources. Making sure that your content is being promoted through the right social media channels, includes landing pages designed to collect leads, and integrates with your sales process so that leads are consistently delivered to your sales force and followed up promptly, are critical issues to consider. Effective strategic communications and content planning is a process that has become more important that ever before. The proliferation of digital channels, the convergence of publishing, marketing and journalism, and the difficulty in being heard means that it is imperative for companies to take a process-driven, systematic and deliberate approach to communications planning. And never forget: If you want to be heard, start with a powerful story.